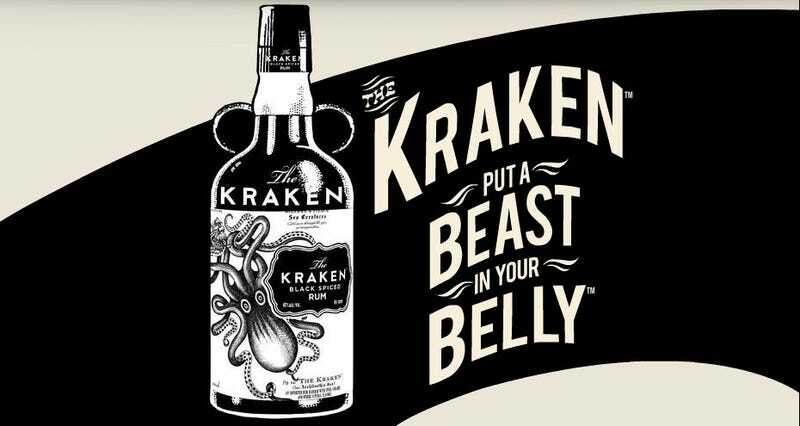 We've got the perfect spirit to ring in the New Year, Kraken Dark Spice rum. It's dyed the same color as the evil beasts monsters ink squirts — just think of the toasting potential! We've seen Kraken, which you'll have to find at your local supplier, sell for around $16.00 online, which isn't a bad deal, plus the bottle is pretty gorgeous. And we've got to give it to the marketing department for going all out on their commercial and educational Kraken videos. The Kraken drawings are actually rather gorgeous. Thanks for the tip SupaChupacabra!